The superb flavors and aromas of these 3 spices come from careful, expert farming and hand-processing. You thought you knew chili, paprika, and turmeric? Think again. Former chef Ethan Frisch's trio of extraordinary, single-origin spices showcases how the best farming location, growing techniques, and hand processing build delectably distinctive flavors and aromas. Black Urfa Chili: Rich, malty. Grown in Turkey, the chilis are ripened, sun-dried, and cured in their own juices for a deeper flavor. Try it in: stews, tomato sauces, salad dressings, eggs, even brownies and other desserts. Smoked Paprika: Rich, deeply smoky, savory/sweet. Sourced from Spain, the sweet pimentón peppers are dried for several weeks over oak coals, intensifying their flavor. Try it on: eggs, potatoes, roasted vegetables, popcorn, corn on the cob, hummus, and stews. 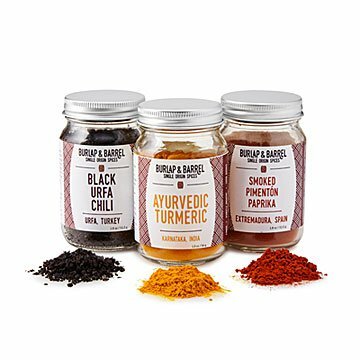 Ayurvedic Tumeric: Sweet and floral, without the metallic bitterness found in lower quality turmeric. Organically grown in India, it's irrigated using a special water conservation method, then hand-harvested, sun-dried, and ground fresh. Try it in: curries, sweet and savory salad dressings, stew, baked goods, lattes, and teas. A former line cook and pastry chef, native New Yorker Ethan Frisch is cooking up new ideas about making international spice supply chains transparent, traceable—and extra delicious. Ethan realized that single-origin ingredients draw attention to the unique environments and expert, committed farmers who grow them. Now he connects­ smallholder spice farmers to high-value markets, focusing on products with unique local characteristics, grown using traditional techniques. He and his team believe that standard measures of sustainability must evolve to consider the farmers, not just the ingredients, and hope to educate consumers about the impact of product traceability on human rights.